sassyfrazz: Saying "Thanks a Million" with Banquet meals! Banquet meals (frozen dinners) are great for on the go, something quick and easy, to bring to work, or just to enjoy. When I was little, I ate many of the chicken pot pies...and it was a treat! I think that Banquet meals and entrées taste great, and they are super easy to prepare. I really like the big bag of chicken nuggets or strips (and so do my kids). 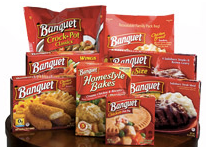 Banquet has been producing frozen home dinners for over 50 years, and they have been feeding so many people! Banquet dinners are great to keep in the freezer for those times when everyone is gone, and you need to make something for yourself. Sandwiches don't seem all that appealing, and fast food can be pricey. Banquet meals are affordable, and good tasting. Banquet meals also come in handy when life takes a busy road, and you really don't have the time to prepare a big meal...For nights like these, it helps to have some great rescue meals on hand, like Banquet frozen entrées. Dinner that the whole family will enjoy is on the table in minutes. Banquet offers more than enough single-serve dinner varieties so each family member is covered – whether you have kids who are picky eaters and only like Macaroni & Cheese or Chicken Fingers, or adults who prefer more sophisticated options like Chicken Pasta Marinara, Sweet and Sour Chicken or Creamy Pasta Carbonara. I like that Banquet can give you options to meet the likes and tastes of many family members. As a way of saying "Thanks a Million" to their loyal customers over all these years, Banquet is giving away more than $1 million worth of redeemable cash prizes this February through April. February 8, Banquet frozen dinner meals came out with the "Thanks a Million" logo on the box. Each of these specially-marked packages will contain a special game piece, either one of over 16,000 redeemable cash prizes worth anywhere from $10 to $100,000, or a Banquet coupon. What's better than that? A quick dinner on the table in minutes and a chance to find the equivalent of the "Willy Wonka" golden ticket! That would make my day!! So, go to your local grocery store, or a superstore, and pick up a few Banquet meals! I wrote this review while participating in a blog campaign by Mom Central on behalf of Banquet and received a sample to facilitate my candid review. Mom Central sent me a gift card to thank me for taking the time to participate.